Hello everyone! My name is Daniella and I am one of the new members on the SCS design team! 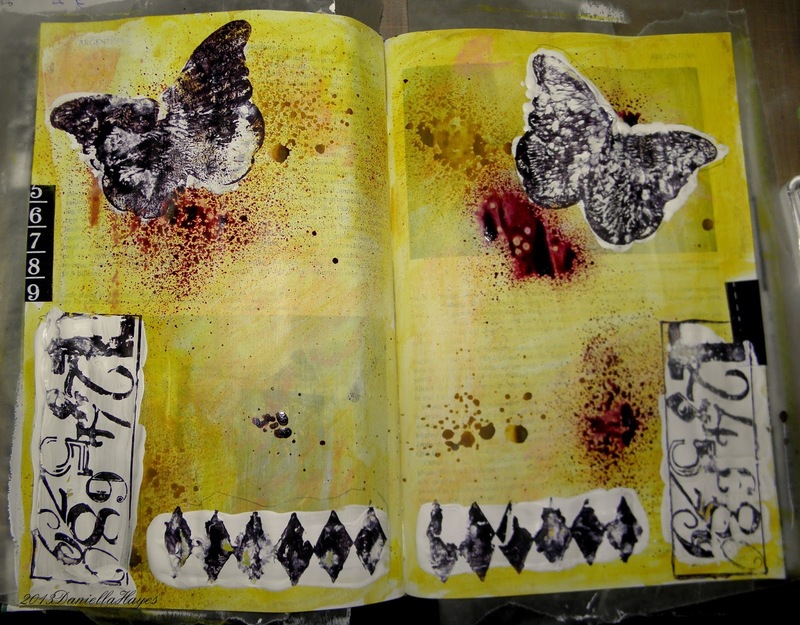 For my first post, I want to share how I used Sin City Stamps in my art journal pages. I am taking the class that the AWESOME Terri Sproul has on Facebook. Click HERE if you want to join the fun!! This week, we learned about texture. And we were to use a quote about mistakes. 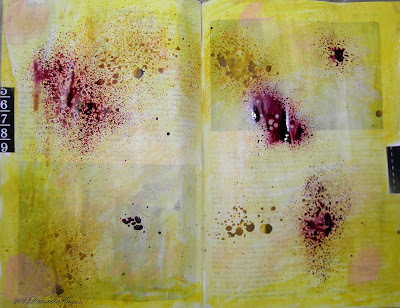 I started by priming my pages with Gesso and then I used Gelatos in Yellow, Gold and Pink. I had to spray some ink on too! TIP. When you have bottles of things that are sticky or get hard at the lid, (like gesso) just put vaseline on it. Your lids will always come off easily. My art journal is an old encyclopedia. I don't have any texture paste yet, (it is coming in the mail) but I had to think of something! So I laid down thick areas of Gesso and stamped into them! I put my Stewart Superior pigment ink "Regal Burgundy" on the stamps and made texture. I used 2 stamp sets here. Love of Butterflies and Art Journaling with Terri Sproul. It is so cool how the ink stayed on the slightly wet gesso and made an imprint. Super fun technique! These stamps are so deep etched they made an awesome impression! After the gesso dried I went over them with my yellow Gelato and I stamped the brick from the Art Journaling with Terri Sproul 2 set. The brick brings visual texture to the page. 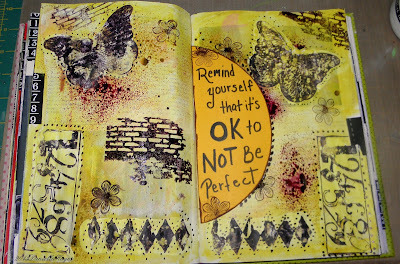 I used the quote "Remind yourself that it's OK to NOT be Perfect". 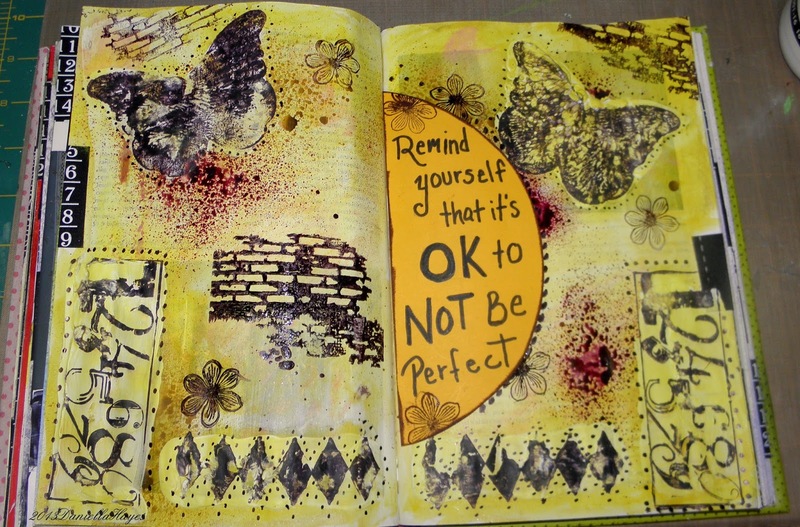 I love the quote and that the pages are tactile and visual in texture. I hope you enjoyed my post! I look forward to getting to know everyone!! Labels: Art Journaling with Terri Sproul, Art Journaling with Terri Sproul 2, Gelatos, Gesso, Love of Butterflies Set, Splash Ink, Stewart Superior Pigment Ink "Regal Burgundy"
Like I said on your blog, this is wonderful! Love the colours you have used and great step by step photos! This is simply wonderful, Daniella. Love how you got your texture, and the stamps look awesome on your pages.